The law prescribes limit within which an action must be brought for the wrong and if this prescribed period is over,expired, the right of action is barred and remedy ceased to operate law helps those only that is diligent about their right. Delay defeat equity .Law will not help to those who were sleeping over their right for pretty long time. In England the limitation Act,1939 as amended by law reform (limitation of actions etc) Act 1954,fixes time during which action of tort must be brought. On the other hand in India. 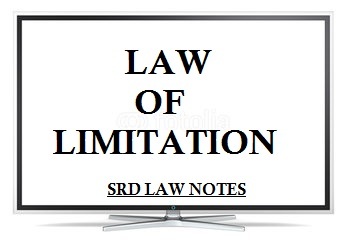 Indian limitation Act 1963, provides the prescribed period during which existing right can be enforced in the court of law. It dose not create nor define any cause of action. the object of the Limitation Act is to enable the parties to file suit within certain period and forbid them from filing suit after period. the object of the law of Limitation is to ensure private justice to suppress and perjury and to quicken diligence and to prevent oppression.